This archive holds all posts form September 13, 2009.
white, black, and Latino Americans. rising poverty and unemployment, and decreasing access to healthcare are undermining recovery in communities of color, slowing the engine of America’s struggling economy. • Unemployment is 26.5% for young Black men, 14.2% for Young Latino men, and 11.7% for young White men. • Wages dropped 5.6% for Latinos, 4.4% for Asians, 2.8% for Blacks, and 2.6% for Whites. • Poverty has reached 24.6% among African Americans compared to 23.2% for Latinos, 11.6% for Asians, and 11.0% for Whites.
. . . Greater than 1 in 10 white men aged 20-29 are now unemployed, up from approximately 1 in 20 when the recession began November of 2007. Those are sobering numbers. 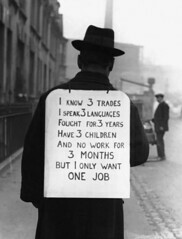 Graver still, a devastating 1 in 4 Black men and 1 in 6 Latino men, aged 20-29, have become unemployed. • The percent of uninsured is 30.7% among Latinos, 18.9% among African Americans, 17.1% among Asians, and 10.8% among Whites. In addition to showing once again that this is far from an egalitarian country, these data help explain why the demonstrators in Washington, DC, yesterday (Sept. 12), estimated around 50,000, against President Obama and his health care plan were almost all white. Whites as a group simply are not hurting nearly as much as black and Latino Americans, and many other Americans of color, are when it comes to jobs and health care. The report calls on government to make federal and state “stimulus” efforts extend realistically to all communities of color, which they currently do only in a very limited fashion. It also calls for a much “better job” of government reporting on just how the stimulus money is being spent, and for whom.